Arsenal left it late but they eventually found a way past Huddersfield as Lucas Torreira scored a stunning winning goal to seal all three points. The Gunners looked set for a frustrating afternoon in their bid to find a breakthrough, but they finally found a way past the visitors in the 83rd minute. 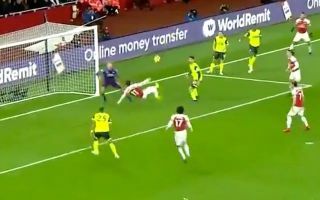 After some excellent perseverance and work from Pierre-Emerick Aubameyang, the ball found its way back into the box and Torreira did the rest with a brilliant overhead kick, as seen in the video below. In turn, not only does it secure the win for Arsenal, but it stretches their unbeaten run to 21 games across all competitions. Further, they temporarily move up into third place in the Premier League table, albeit both Chelsea and Tottenham still have to play on Saturday. Nevertheless, Unai Emery’s side are showing real resolve and belief in maintaining their impressive run, and Torreira certainly provided them with a huge boost in finding a late winner to ensure that they put the pressure on others to now respond.